UFV lent its support to Stó:lō Means Business, an economic business initiative focused on providing support to assist Aboriginal business growth within Stó:lō traditional territory and establishing Stó:lō as a leading centre of Aboriginal business. Shirley Hardman, UFV’s Senior Advisor on Indigenous Affairs, serves as board chair of Stó:lō Community Futures, which presented Stó:lō Business Match, a event connecting Aboriginal and non-Aboriginal businesses and organizations using an online dating/business profile tool and “speed dating” in-person meeting format. 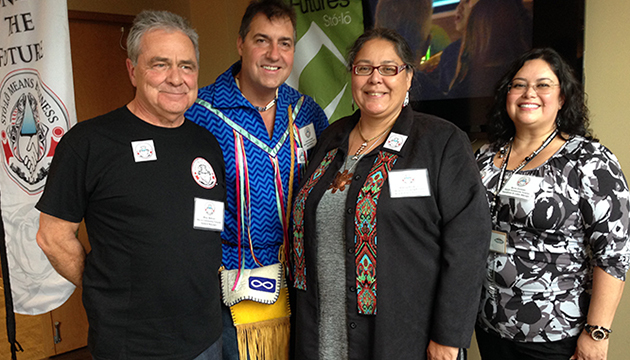 The event was part of Aboriginal Business Match (ABM) Series. There were $30 million worth of deals signed at ABM events in Saskatoon and Penticton in 2014. UFV’s School of Business had a booth at the tradeshow component of the Stó:lō Business Match event. Frank Ulbrich, Director of the School of Business, and Dean of Professional Studies Tracy Ryder Glass had meetings set up with groups including Sto:lo, Ts’elxweyeqw, Soowahlie, Four Corners, Seabird, Shxwha:y, Tzeachten, Leq’a:mel, Skawahlook, Shxw’owhamel and Chilliwack Metis. More information on the event is available in this Chilliwack Progress article.